JANG Jae-hyun’s exorcism thriller The Priests was the surprise top draw at the Korean box office during November, accruing 4.93 million admissions (USD 32.81 million) and helping Korean films recapture a majority share of the market. All told, local films accounted for 68% of business during the month with 10.41 million tickets sold out. This was the second best performance for the local industry in November, behind 2012, when the domestic industry sold 11.7 million tickets for a 73% market share. With a total 15.28 million tickets (USD 101.74 million) sold, November 2015 was the second busiest on record, once again just behind the 15.95 million admissions tallied in 2012. The figure was marginally higher than the 15.19 million recorded in November 2014 and significantly up from the 13.38 million of November 2013. 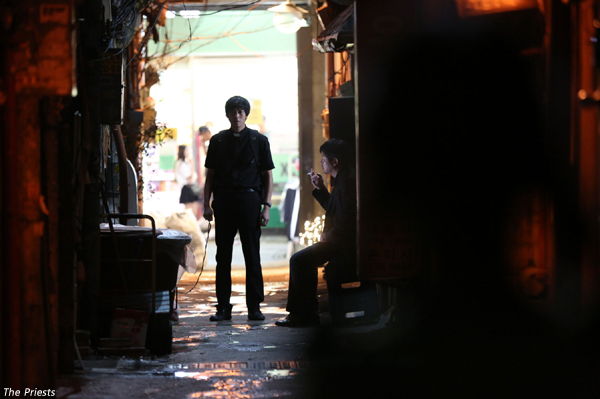 Featuring the tantalizing combination of stars KIM Yun-seok and GANG Dong-won, The Priests became an unexpected hit following a number of mid-level local thrillers entering the marketplace in October and November. Helping JANG’s film boost local admissions was WOO Min-ho’s political thriller Inside Men, which brought in 3.75 million admissions (USD 25.51 million) and is still the top draw at the box office. A return to form for star LEE Byung-hun, the film has capitalized on the public’s recent discontent with figures of power in Korea. Helping out for the local side down in fifth place was YUN Jun-hyeong’s kidnap thriller FATAL INTUITION, which added 593,688 viewers (USD 3.98 million) to its total following a first place opening in late October. Leading the American contingent, which only mustered a 24% market share during the month, were the under-performing franchise entries Spectre (the 24th James Bond installment) and The Hunger Games: Mockingjay - Part 2, with 1.79 million (USD 11.95 million) and 694,535 admissions (4.45 million), respectively. Meanwhile, the top limited player was the rerelease of Michel Gondry’s Eternal Sunshine of the Spotless Mind (2004), which added 242,189 tickets (USD 1.7 million) to its original run.